Baby it’s cold in Minnesota this week!! Monday’s high was -5° F (overnight low was -15°) and the low for Tuesday will be worse! Most of the north Minnesota schools will close. The wind chill will be around -45°. Did you know an egg will freeze in just seconds with these temps? I am so happy I fly to Colorado on Tuesday for meetings. I will be out there till Thursday night when I return home. Reading the weather reports the Longmont area temps will be in the upper 50’s so it’s going to feel like a heat wave for me. Chris decided to make fish tacos tonight for dinner. I love her fish tacos and suggested to her that I could eat them every other week. If you want to read about her recipe here is the link; Fish Tacos. One new addition to her fish tacos is a home made Chipotle sauce. Its a little spicy and I love that! I wanted to pair a white wine that would go with the meal. I had some pretty good whites in my cooler in our pantry so I wandered over and opened the door. Immediately my eyes spotted a bottle of 2011 Kunde Wildwood Vineyard Chardonnay and I knew the style of this Chardonnay would pair very well with dinner. As Chris was preparing our plates I grabbed by tasting sheet and pulled the cork. I poured us both a glass and we sat down to eat. Before I tried the fish tacos I made some notes. 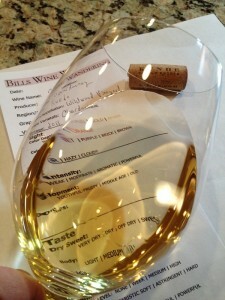 The hue was a nice “Gold” and very was very clear in my glass. The Chardonnay was very aromatic and fruity. We could smell Pineapple, Pear, Lemon and Green Apple. It was pretty damn good! The Chardonnay was slightly sweet, medium bodied and well balanced. There were no tannins. It was very balanced, flavorful, and we could taste Green Apple, Pineapple, Melon. The 2011 Kunde Chardonnay was slightly buttery (I assume they used Malolactic Fermentation in oak) and it had a nice long finish. 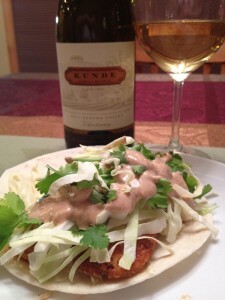 The other nice thing about the 2011 Kunde Chardonnay was it cut right through the Chipotle sauce on our fish tacos. They worked very well together. 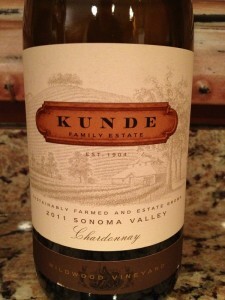 I rated the 2011 Kunde Wildwood Vineyard Chardonnay. After dinner I recorked the bottle so Chris could enjoy a glass for dinner the next day in my absence.